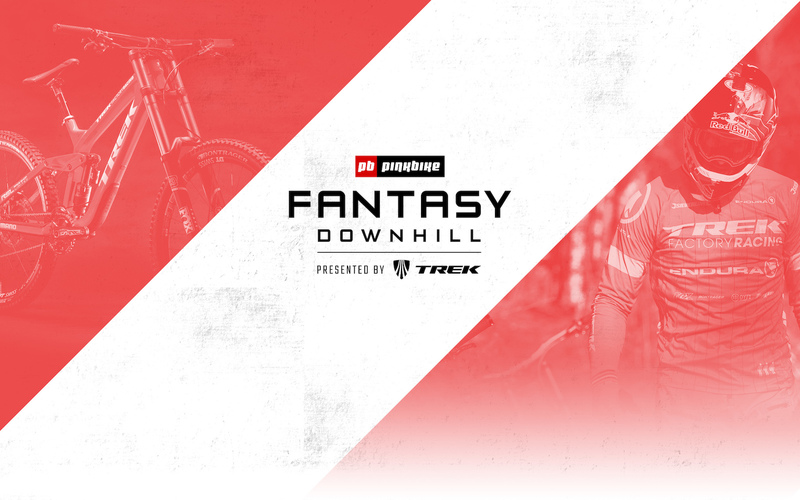 You must a registered Pinkbike User to play Fantasy Downhill presented by Trek. If you are not a registered Pinkbike user you can sign up for FREE. 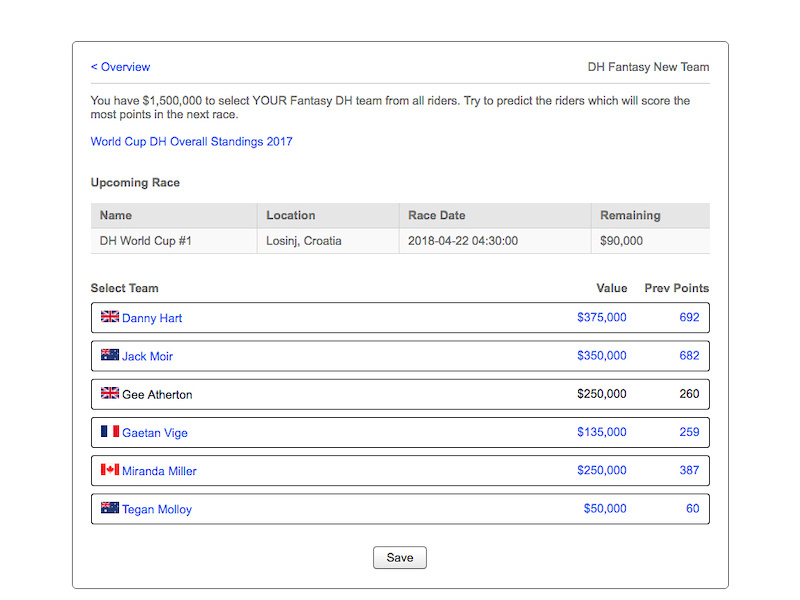 Each player has a virtual $1,500,000 budget to build their Fantasy Team. 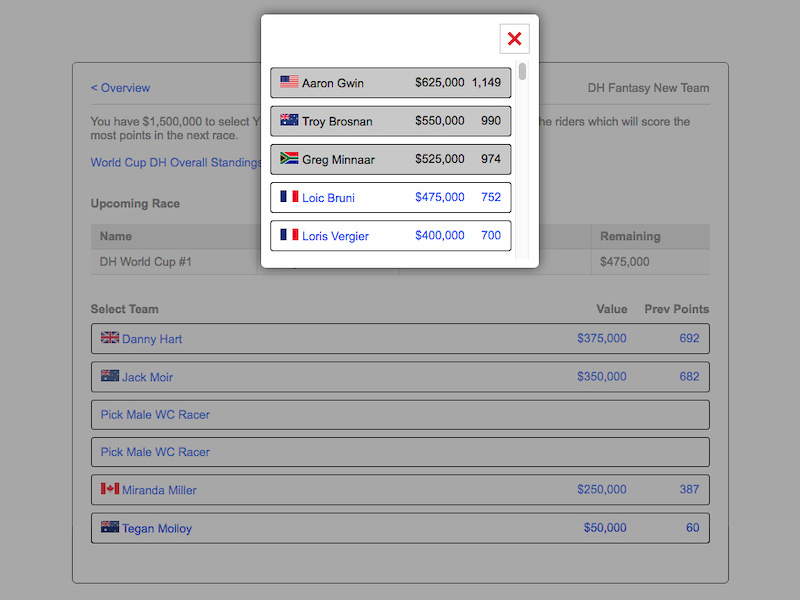 Pick your rider by first clicking the Pick WC Racer button and select from the drop down menu. Repeat for all 6 Racers. You can see the value of each rider in the drop down menu. Remember you do not have unlimited budget, so pick wisely. TIP: check riders' social media, declared plans for 2018, and early season results to help make your decisions. You do not need to spend all your budget to build your team yet you can only spend up to the $1,500,000 limit. Once you have all your team selected, click Save. Every round each participant can make as many changes as you like. Your changes will be restricted by your available budget. To make changes select EDIT TEAM button and then select the rider you wish to change. Then choose your new rider from the drop down list. Team changes are permitted up until 5:30am April 21st, 2018. After that your selections are locked in for the first race, and you can make changes to your team per round after each race. There will be a countdown timer for team changes each round. For the final race, UCI MTB World Championships, new athletes may be added to the list of available riders. Users can create a League to compete with friends. Note: You can only join one other league. Click the CREATE LEAGUE button to create your own League. You will be asked to create a password. You can invite friends by sharing the league link and providing your password. You can opt to join another league. Click CHANGE LEAGUE button to see a list of alternate leagues. Note: To Join a new league you may require a password as issued by the league creator. There are prizes for each round, as well as a Grand Prize for overall top team after all 8 rounds at the end of the season. 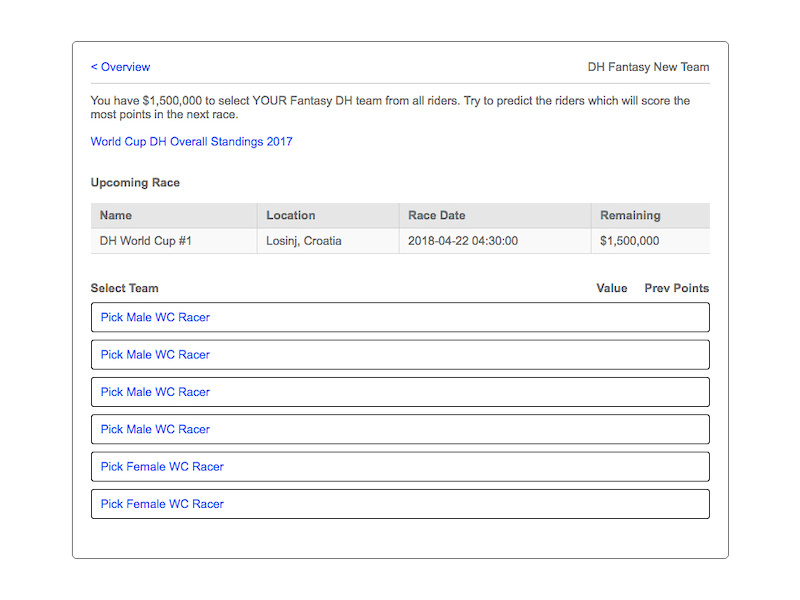 Grand Prize: The Fantasy Team with the most points after all 7 rounds of the 2018 UCI DH WC and 2018 UCI DH World Championships will WIN a Trek Session 9.9. 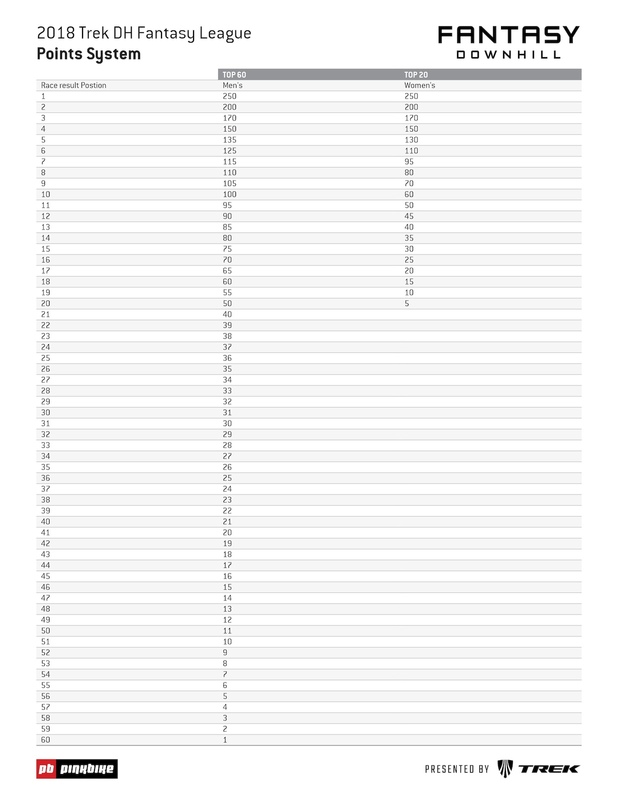 Should there be multiple teams with the same total cumulative points scores, the grand prize will be awarded through a random draw. 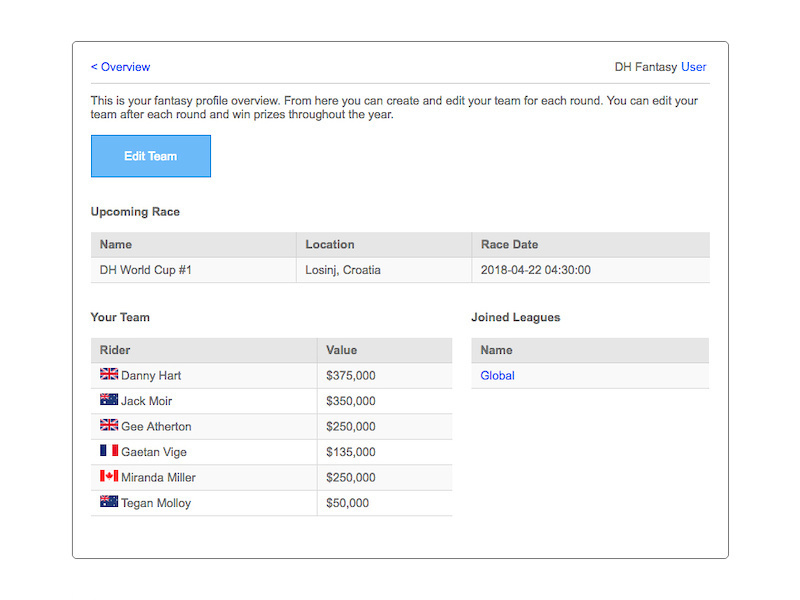 Round Prizes: Each race round will have a prize for the Top Fantasy Team of that round. Should there be multiple teams with the same total points for that race round a random draw will occur to determine the prize winner. IMPORTANT: We recommend you have your team created by April 19th 2018. You will want to maximize your points score and have your team present for all races! Teams created at a time after races have previously occurred earlier will not be eligible to back log points that riders would have accrued from previous races. @karl-burkat: Why does it say I have 0 points after todays race? Does the "league creator" need to send / share the link to the league or can I find it on my own (which I haven't been able to do). I have password but they aren't able to send / share at this moment and are "technically" challenged to boot! The save button is not coming up on my phone. Android. Whats up with that? I dont have a laptop. It's a cool contest! But it's a bit annoying that it is possible to "buy" riders which is not going to race, they are not on the riders list at all..
What is the reason why some of us did not get any points? I had a good number of my team finish in the top 10. Why are there no junior women starting in elite 2018 to pick from? The selection is limited enough for women. the riders you can choose from cost too much to be able to pick 6 riders. You are over budget after 3 riders. 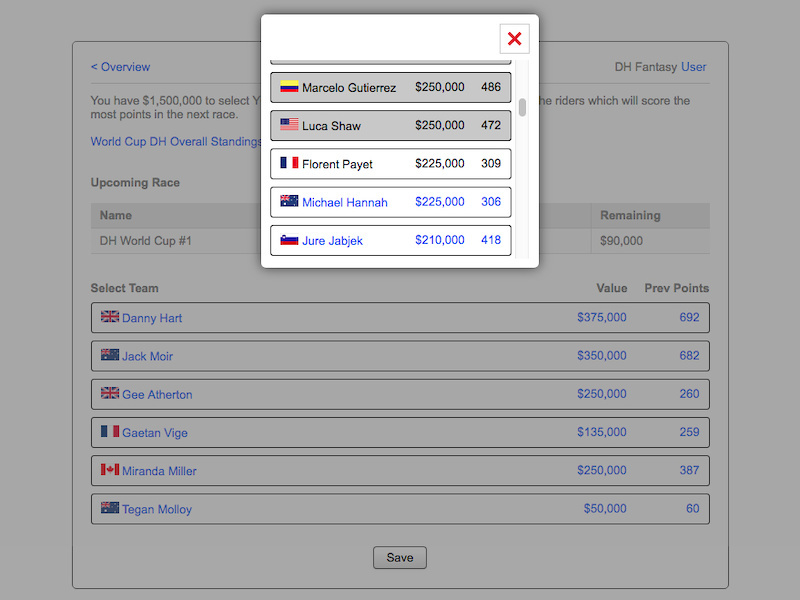 A bit annoying that it is possible to "buy" riders which is not going to race, they are not on the riders list at all.. I had 3 riders on the podium yet I’ve scored 0 points how does that work pinkbike ? How come I’ve ended up with 0points despite my team having 3 top ten finishers? Can I select a rider who didn't race last year due to injury, but is going well this year (Katy Curd)?? Can't find "Create League" button to compete with friends. Where is it? @kerberos: I still do not see the button for create new league. Below your riders there are two buttons, the right one says "Create League". If points for men and women are equal, then statistically speaking you should invest heavily in your female riders. What happens when you click save? My trust on ol dawg .. brendog kind of stuff for wc #1 .. way to go freeracer! Except that Dirt Fantasy League was a total Fail. I knew more than a dozen people who started and not one single person who put up with their mistakes, inconsistencies and slow updates all the way to the end. @jm2e: Dirt had a few good years back around 2012 / 2013, but I agree that the last time they did this it was total garbage... 2016 was the last one, I think. Do you need to fill all six spots or can you have empty spots in your roster ? If you don't use your entire budget, does the excess get transferred to the next race? @karl-burkat: I tried to edit my team about 10 mins before the deadline clock on the PB main page went to zero. Then a message showed up that changing teams was already closed. Why that? What about people with no pinchi Facebook!!!! Why can't I see a save button on any browser or any device I use? Once you pick all riders for your team, you will get a button to save. Still not getting it? @karl-burkat: I found it a bit irritating myself at first. There's no way to save an uncomplete team, like a draft. But once you are complete, it can be saved. Similiar issue is you can't remove a rider, in order to disencumber your budget, you can just substitute a rider. No big deals though. @karl-burkat: Oh... I didn't realize you had to fill all the slots to get a save button. once you pick all 6 riders, you'll be able to save the team. let me know if that isn't working. The save button is not visible for me??! Wont let me join another league - get fked fantasy league!